All-rounder Liam Dawson feels he should have been used more by Hampshire before joining Essex on a one-month loan. The 25-year old was told by Hampshire coach Dale Benkenstein to find some form and improve his batting average. "I got left out of the team. I felt I should have bowled a lot more overs and I batted really well, but was only averaging 25," he told BBC Essex. "Hampshire had their reasons for leaving me out. That's gone, I've come here to Essex and enjoying my cricket." Dawson made seven County Championship appearances for Hampshire in 2015, but failed to score a half-century. 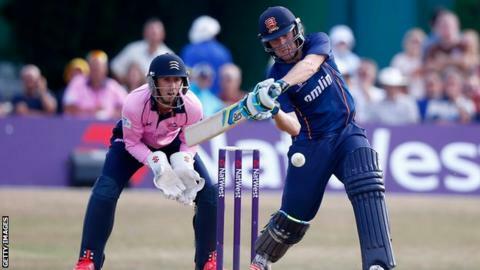 However, on Tuesday he made 99 against Glamorgan at Chelmsford for Essex as he helped his side to victory and says he is happy to be playing cricket again. "I wanted to play some cricket. I haven't been doing that at Hampshire and Essex gave me that opportunity," Dawson said. "As long as I can score as many runs as I can and chip in with wickets the it's only going to be good for Essex and myself."